Go Bananas is a fun-filled 5 reel, 20 pay-line slot set in a tree house in the tropical jungle with mischievous monkeys, juicy fruits and glimmering gems. 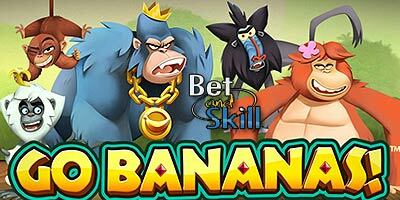 Play Go Bananas slot for free here, get exclusive free spins offers and no deposit bonuses! VIP Stakes: claim your free spins, no deposit bonus or welcome package here! Go Bananas offers some fantastic Wild Monkey bonus features as the five Wild monkeys each bring their own different kind of Wild. You have the Wild Orangutan, Wild Langur, Wild Baboon, Wild Tarsier and Wild Gorilla. The lack of any type of additional bonus feature does make this slot a fast playing game which may appeal to a lot of players including you. "Go Bananas slot - Free Play - No deposit bonus - Free Spins"